Mount Field took my breath away. Lush and green, with trailing streams along the path. 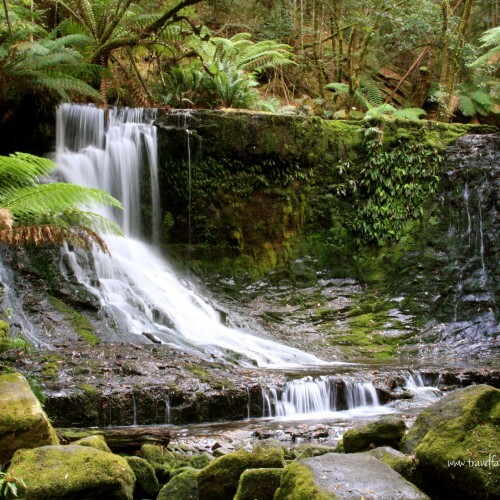 The trails meander along the creek, to the stunning Russell Falls. It was an easy walk to the bottom of the falls. The hike to Horseshoe Falls, at the top of Russell Falls, was a little harder. But, it slowed me down just enough to really admire my surroundings in more detail. After a morning wandering around in Richmond, we programmed our GPS for the route to Mount Field. I was really looking forward to this piece of our trip as I was eager to photograph Russell Falls. We were pleasantly surprised that the GPS took us on backroads from Richmond to Mount Field. Gotta love Lola (the name we have given our GPS). The route took us through wine country, hops country (a primary ingredient for my new favourite Aussie beer – Cascade), and along the Derwent River. We drove on the opposite side from the main highway. We were happy to take our time on the quieter road. We passed logging companies on our route, with many a logging truck hauling their immense loads on the narrow road – a bit scary at times, I have to admit. After an hour and half drive, we arrived to Mount Field National Park. 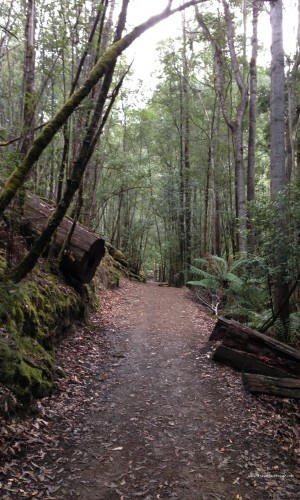 We grabbed some sandwiches at the restaurant and headed to the trail with my camera and tripod ready to go! Mount Field is, without question, my new favourite National Park. From the start to the end, Mount Field took my breath away. Lush and green, with trailing streams along the path. It was an easy walk to the bottom of the falls. The hike to Horseshoe Falls, at the top of Russell Falls, was a little harder. But, it slowed me down just enough to really admire my surroundings in more detail. At the base of the falls, I spent a good two hours taking photos of Russell Falls and the cascading water. 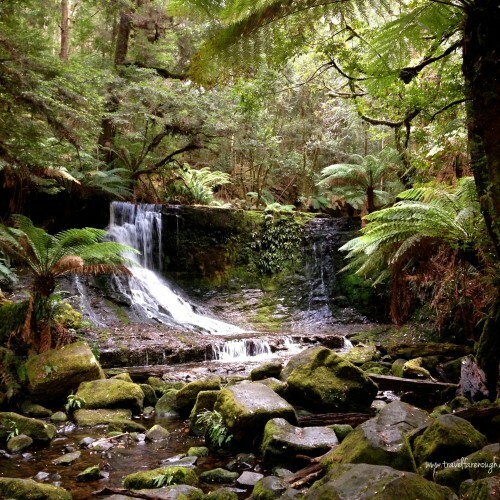 We met another photographer who captivated us with his stories of places he’s shot in Tasmania. He even gave us a few tips on how to sell photos, which was interesting because he sold soap for a living. I’ve never felt as comfortable with another photographer, talking ‘shop’, nor as welcomed into the club as I did that afternoon. It was refreshing really. We left the trail after the main office had closed and the sun was beginning to peak past the mountain. Before leaving, we checked out the camping areas. This is definitely a place I will add to my ‘must camp’ location list! It was well laid out, private yet not too remote. 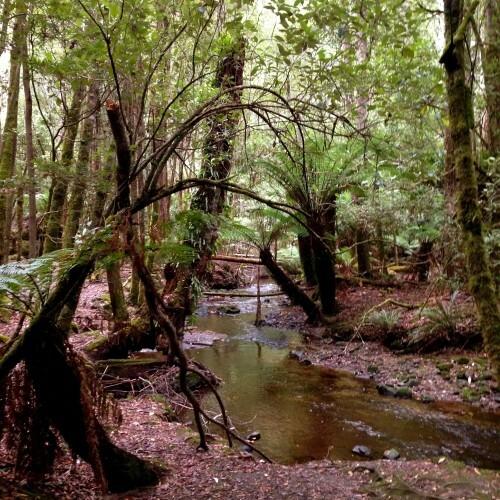 I was not surprised to see it on Australian Geographic Travellers Top Camping Spots. For now though, we returned to Hobart, taking the highway this time since it was getting dark and country roads bring out the wildlife. Not something we want to deal with at night, in the country and with a rental car! Besides, there was a beer with my name on it awaiting me in town! We’ll definitely return to Mount Field. You can count on that. 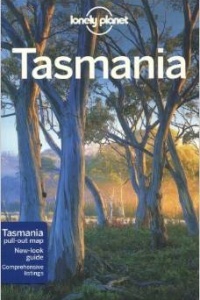 Check out these recommended guidebooks for more on travel in Tasmania. Where is YOUR favourite National Park? Let us know by adding a comment. Come on, be a part of the community!